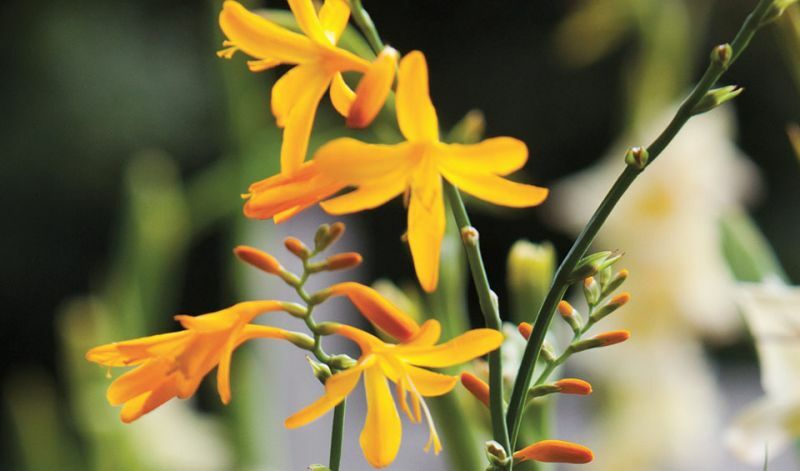 Crocosmia form tufts of erect, sword-shaped leaves and an abundance of funnel-shaped flowers that are carried on graceful, wiry, arching stems that will bloom from 5-8 weeks. They prefer light sandy soils with good drainage. Water well all Summer long though. Crocosmias are loviest in front of green conifers, among dark leaved dahlias and cannas or next to blue-flowering plants such as Agapanthus (Lily of the Nile), Aconitum (Monkshood) or Echinops (Globe Thistle). As cutflowers they will last up to two weeks in a vase. In borders, flowerbeds and perennial gardens. 'Babylon' (orange-red), 'Columbus' (orange-yellow), 'Emily McKenzie' (orange), 'Lucifer' (red) and 'George Davidson' (yellow). Native to the grasslands of Cape Floristic Region in South Africa.